B2B customers in the digital age have greater access to information. They are actively researching solutions and providers before engaging with a salesperson. As a result, content marketing is becoming more prevalent and receiving lots of investment. The interest in content marketing, however, has created tough competition and higher customer expectation. How can you make sense of all the trends in the content marketing world and make sure that your strategy will bring in results? 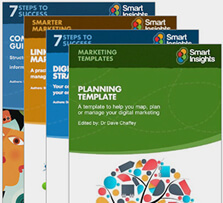 Read our 7 steps guide to content marketing for practical advice on how to develop a strategy to deploy content across all your online marketing. Less than half of businesses have a content marketing strategy, so get (and stay) ahead of your competition with our strategies. 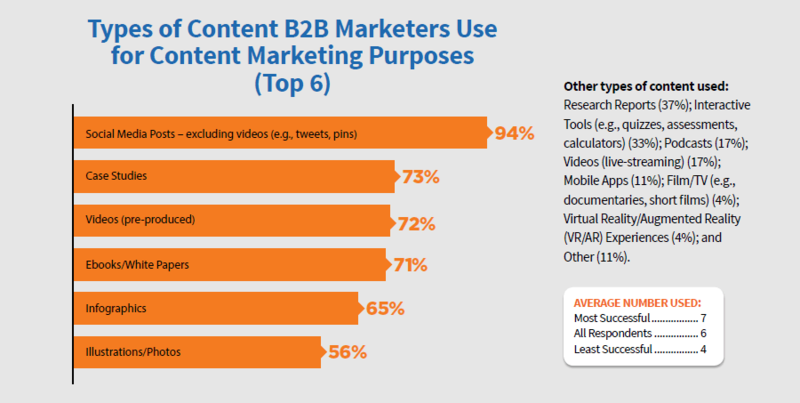 Here are seven B2B content marketing research insights that should guide your strategy to success. Havas’ Meaningful Brands studies focused on the connections between brands and people’s life that bring in a business result. The second study started from 2006 to 2016, involving approximately 300,000 participants from more than 30 markets. It surveyed 1,500 brands from 15 industries about the role of content for brands and people. 84% of respondents expected brand to provide content that entertains, tells stories, provide solutions, creates experiences and events. However, they regarded 60% fo content as poor, irrelevant, or failing to deliver. While this research isn’t specific to B2B content marketing, it is a good reminder of what your target audience expect from you. After all, B2B decision makers are individuals with expectations and preferences. In the case of B2B customers, they will look for content that is valuable to their business. What are some examples of meaningful content for B2B buyers? Instead of explaining product features, they will look for case studies to show how your product helped another business. They might also watch interviews with industry leaders to keep up with the latest trends or look at research that might guide their strategy (like the one you’re looking at right now). Marketing in the digital age is customer-centric. Valuable content focuses not on the features of your product, but how you and your product can make life easier for the customers. You content strategy should help people articulate their problems, find solutions, and compare different providers. How Content Influences the Purchasing Process by CMI in 2017. The three most important qualities of content that influenced the purchase process were: addressing pain points, providing product specifications, and being educational rather than promotional. In 2014, Google and Millward Brown Digital collaborated on a research into B2B marketing. They analyzed 13 months of clickstream data from Millward Brown Digital's desktop panel and surveyed 3,000 B2B researchers on research and purchase habits. The study showed that almost a quarter (24%) of non-C-suite had the final authority and 81% of non-C-suiters have a say in purchase decisions. In the B2B world, the decision maker and end user might not be the same person. If your content strategy exclusively targets top-level executives, you’re missing out on a large group of audience. Some decision making power has trickled down as senior executives rely on their team to research and provide suggestions. As a result, you should develop content for different target audience and personas, highlighting the benefits of your product for different segments. For example, if you’re selling productivity software, the CEO and the accounting department might make the final decision, but everyone in their company will use your product, from the sales to the HR department. Your content should show how productivity software can help different teams functions and how your product is the right fit for your prospects’ company. Linkedin’s 2018 Rethinking the B2B Buyer's Journey showed that on average, B2B buyer worked with three to four additional team to come to the final decision. In 2017, The Boston Consulting Group partnered with Google to research the importance of mobile in B2B markets. They analyzed Google B2B search query, surveyed B2B buyers, interviewed leading marketers, and assessed marketing performance. The study included 3,000 B2B buyers from multiple verticals such as cloud services, enterprise software, and more. The research showed that 50% of B2B queries were made on smartphones, and this figure is expected to grow to 70% by 2020. This was because internet search heavily influenced the purchase decision, and the use of mobile at work was increasing. Potential customers may interact with your brand through different touch points, and many of them will be on their smartphones. Therefore, the mobile experience can play a key role in customer’s perception of you. If you haven’t considered the importance of mobile, then it’s time to integrate mobile into the purchase journey. Mobile friendly content requires a different approach than desktop. There’s more to mobile optimization than responsive design. Customers expect fast and seamless experience across different channels. They need a quick-loading website that integrates with smartphone functions. Your website might need to reduce the texts, minimize data entry, and replace them with other types of content such as images, videos, or webcast. Make sure to include a mobile number and social channels. Your email also needs mobile optimization so prospects can check them out anytime they want. Despite the growing numbers, mobile still hasn’t received the same budget and attention from B2B companies. One reason behind companies’ reluctance to adopt mobile approach is their low mobile traffic. They are not sure if this is because the target audience doesn’t use mobile, or the mobile experience isn’t very good. There’s only one way to find out - test and monitor. Your team can only build capabilities and assign budget based on actual experience from different channels. 2014 IDG Enterprise/IGS Mobility Survey, where 77% of senior executives reported that they used a smartphone to research product or service for their business. In 2017, the Content Marketing Institute and MarketingProfs surveyed more than 2,000 B2B marketers from all titles, industries, and business sizes around the world. The study looked into their perception of content marketing success, strategy, goals, metrics, budget and more. The results showed that the average marketers in North America and Australia used six different types, while marketers from the United Kingdom used five on average. The most common types of content are social media posts, case studies, videos, white papers, infographics, and photos. While blogging is important for your business, consider expanding your content format to include images, audio, and more. For example, infographics are easy to view, remember, and share. Videos can communicate your message in a succinct way. Ebook and white papers educate your audience and demonstrate your authority as an expert in a field. Different types of content may work for your industry and audience, so give them a try to see which one is best received by your audience. Ascend2 Content Marketing and Distribution Survey Summary Report, where participants considered the most effective types of marketing content to be video, blogs, social media, reports, and webcasts. In 2017, Demand Gen polled 189 B2B buyers about the use of content during purchase. More than half of the participants were from large enterprises and held C or above level positions. These B2B buyers were most willing to exchange some information for webinars (79%), white papers (76%), third-party/analyst reports (66%), E-books (63%), and case studies (57%). When you are contributing values to prospects, they are much more willing to give back some of their time and information in return. Content such as webinars or white papers can educate the audience and help them understand their problem and possible solutions. By capturing email address and some information about their business, you can then use email marketing tools to nurture these prospects until they are ready to buy from you. Therefore, in addition to the traditional short blog posts, you should consider producing these kinds of content. InsideSales Optimal Lead Generation Methods, where small executive events (77%) and webinars (73%) were identified as the best ways to generate quality leads. Newscred analyzed their client’s data from over 10,000 articles published in Q1 2016. They found that the median average time spent with an article was 37 seconds. Engaged time is defined by the time a reader is actively engaging with the article. It’s tempting to create long articles that are good for SEO and show off your expertise in the field. However, remember that millions of blog posts are published every day, competing for attention. Half a minute is all the prospect takes to skim your content and make a judgment about your brand. In addition to length, quality and readability are also important factors. The quality of your blog, similar to all your content, comes from the value it gives the customers. Your blog post should give readers something to about such as a new idea or actions they can take. Write about topics that your audience care about from a different perspective. You can also add more values to the post with related posts, suggested content, or free white papers. You only have half a minute to deliver your promise, so make sure that your content is easy to read. Use headings, bullet points, and white spaces to help the audience separate different sections and draw attention to key points. Include visuals such as videos and high-quality photos that are relevant to your blog post. Highlight key takeaways and quotes that can be shared across social media. Hubspot Consumer Behavior Survey Q1 2016, where 43% of participants said they skimmed blog posts. The research took place in Q1 2018, surveyed 168 B2B marketing and sales professionals in senior positions. They worked in large enterprises in industries such as business consulting, IT, and manufacturing. Participants place different values on types of content depending on the purchase journey. For the early stage, they want to see infographics, B2B sites, and podcasts. For mid-stage, they prefer analyst reports, webinars, and interactive content. Late stage prospects want ROI calculators and case studies. The B2B purchase journey is long and complex. Therefore, your prospects will appreciate content that helps them move through different stages quickly. Be prepared to produce content for different stages of the journey, and make sure that your sales team have access to them. Top of the funnel visitors will prefer educational content that is easy to read and share. However, from the mid-stage onwards, they are willing to read in-depth content to make sure your company and product are right for them. In the final stage, they are looking for concrete numbers and trustworthy feedback to pick a provider. Your marketing team should be able to justify the production of a piece of content, by identifying which stages you’re targeting and the audience’s expectation in that stage. Marketbridge Ultimate Guide to the New Buyer’s Journey argued that 95% of buyers prefer brands that provide content throughout the buying process that personalized digital engagement gives them an edge. Marketing Manager at Retalo.io, Mike Mai has a postgraduate degree in Business Administration and more than 10 years of experience in marketing. He has been involved in creating content for Retalo’s website and blog and developing a marketing strategy for the company. Mike is also a Certified Scrum Specialist, a training he undertook to bring more agility to content processes as part of his work as a digital marketing specialist. You can follow Mike on Twitter.